Spirit of Christmas seems to be a fitting name for a ride on the Byesville Scenic Railway, because after you hear the stories of the miners from long ago, you will definitely appreciate the Christmas of today. Accompanied on this trip by Miner Dave and Miner Steve, the hour train ride passed by twelve abandoned mines where about five hundred men worked underground. However, in the area there were seventy seven deep coal mines with approximately five thousand men working. The train track here was busy back in the early 1900’s with perhaps one hundred fifty trains going down the tracks on a busy day. Their regular routes went from Marietta to Cleveland, but they went North as far as Canada. 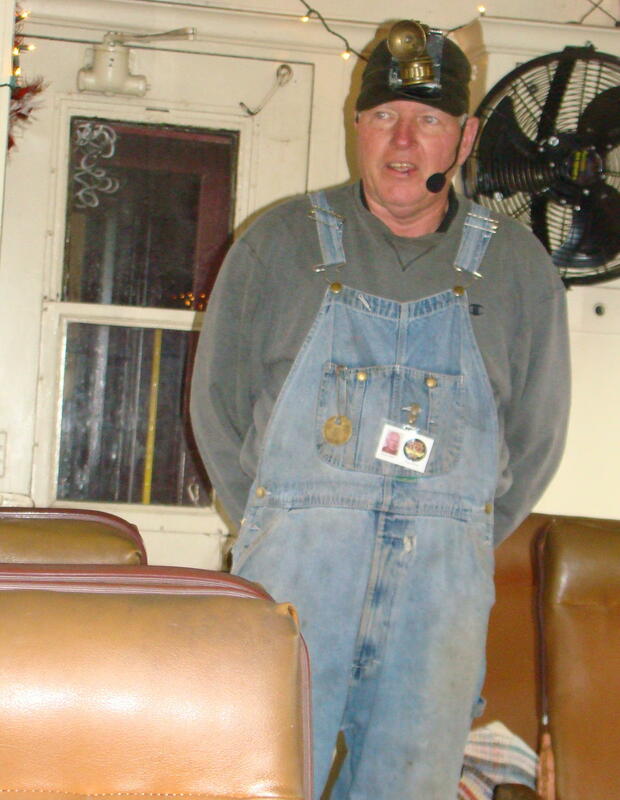 Since it was the Christmas season, Miner Dave asked if there were any teachers on board. Then he selected a lady to read “The Night Before Christmas” as the train went down the track. Miner Dave did appropriate sound effects as well as scene effects behind her back, which made for an amusing reading. Young people are remembered in the mines as children often started working at the age of eight, with their parents’ consent, especially if the father had been injured. Someone had to work to pay their $12 a month rent as otherwise their family would have no place to live. They did indeed, as Tennessee Ernie sang, “Owe my soul to the company’s store.” They were paid in tokens that could only be spent at the company store. So if the family needed an item, they would charge it there, then the man of the family would pay for it on payday. Miner Dave explained that only men worked in the mines as it was thought that women would bring bad luck. They worked about 175 days out of the year. There was no welfare in those days, so they had to use credit…at the company store. For this most dangerous job in the world, there was no insurance and no vacation. There were definitely no atheists working in the mines. They all believed that someone was watching over them. How did you know if you were to work each day? At 7:15 each evening, everyone would listen for the whistle at the mine. If it blew once, there would be work tomorrow; twice, maybe and listen again at 4:15 in the morning; three times, no work the next day. All nationalities headed out to work swinging their dinner pail. The pails could not be set down on the mine floor or the rats would open them and eat their dinner. So miners always hung their dinner pails high on the mine wall. A sandwich made of West Virginia Ham was quite a treat – that ham, by the way, was bologna. They always left a little something in their pail, just in case there was a cave in and they might be below ground all night. If they made if safely through the day, the miners would let the children have their pails on the way home and enjoy a little snack. On Christmas Eve a hundred years ago, the mines would close early for the day at 4:30. Since there was no money for gifts, a stop at the company store might allow them to get an orange or some walnuts for the children. Often they would break a limb off a tree and either stick it in a can or in holes in the handle of a broom. This they would decorate with rags, bittersweet, popcorn, ribbon or berries. Everyone would go to sleep early that night and be up to go to church on Christmas Day in their cleanest bib overalls. When they arrived back home, there would be one or two gifts under the tree. 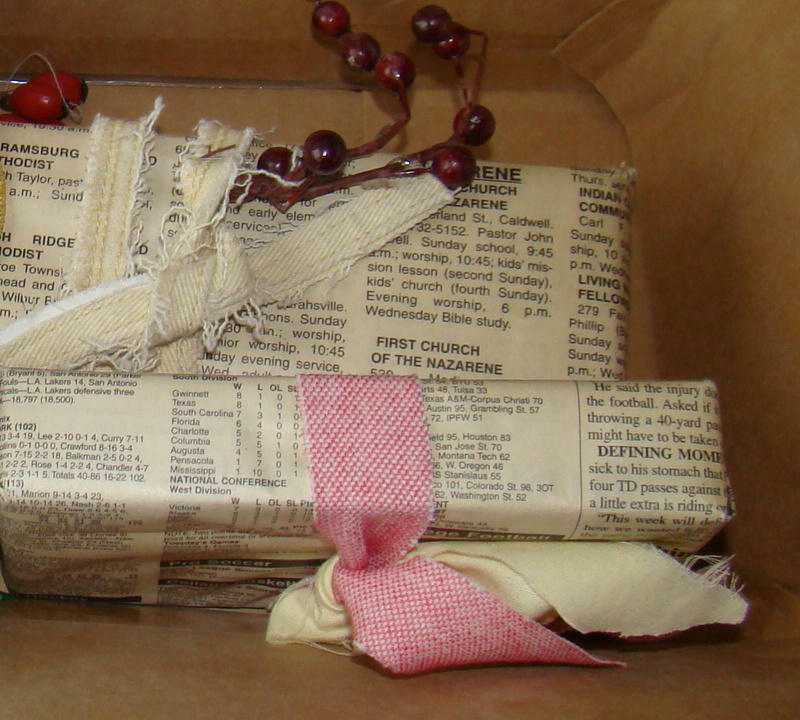 Gifts were often wrapped in newspaper, and then tied with rags and decorated with sprigs of berries. Most were gifts made with love, and all Made in America. 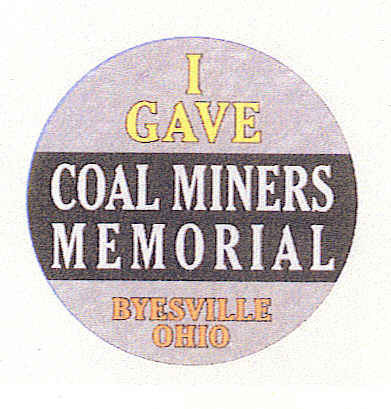 Byesville is the coal mining capital of Ohio and their plans are to erect a monument to the coal miner at their station in downtown Byesville. When you give a donation, you are given a badge that explains the mining story. The colors on the badge are symbolic of life down in the coal mines. Black needs little explanation as it is the color of coal, also know as black diamonds, buried sunshine, or rocks that burn. Red is for the color of blood that was spilled onto the ground from those who either lost their lives or were injured while working about the mines. Someday soon the Coal Miners’ Memorial Statue Fund will reach its goal and the efforts of all the workers and their families will be recognized. Coal miners helped make our country what it is today and will never be forgotten. May the Spirit of Christmas roll on! Byesville Scenic Railway is located in Byesville, Ohio just off I-77 (Exit 41) South of Cambridge. Turn toward Main Street of Byesville, then left at the traffic light. The train depot is one block on the right. Free parking is available along Second Street and Seneca Avenue. 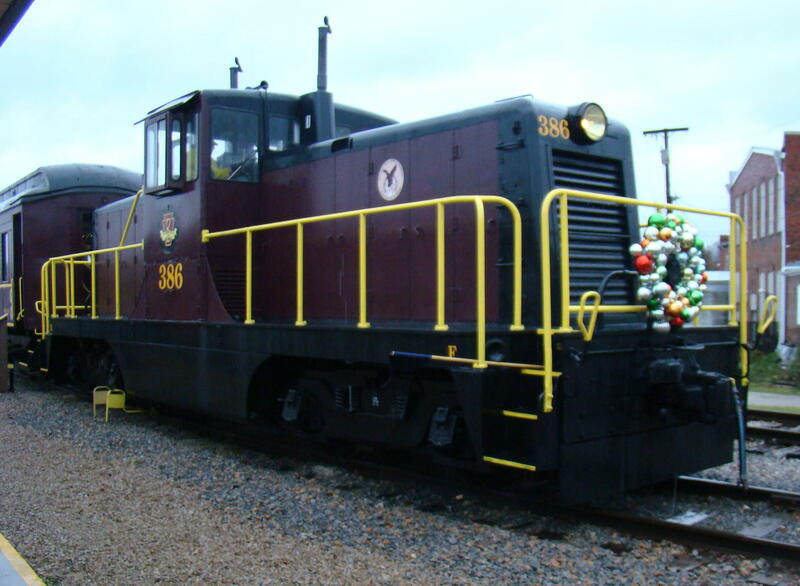 The train operates most weekends during the summer months as well as for special holidays throughout the year. After walking along the beautiful Cumberland River, decided to take a break in an abandoned coal mining town. Today this old mining camp has been restored as an historical tribute to the people who lived and worked there…kind of a museum to Old King Coal. No. 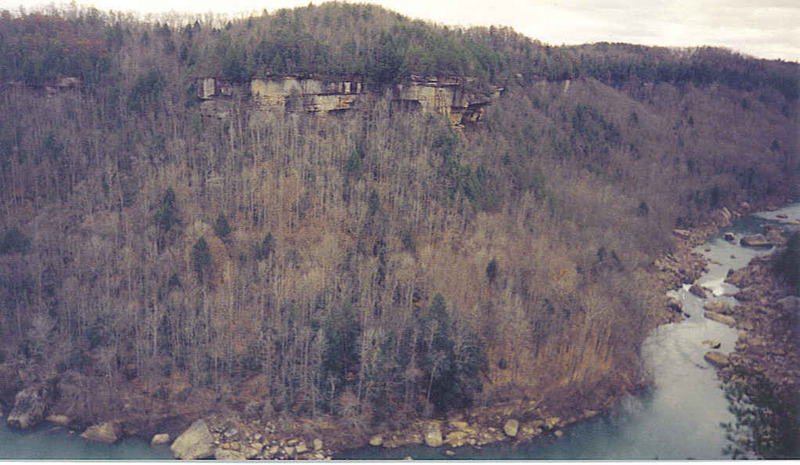 18 Mine Blue Heron is located in the hills of Kentucky near Stearns in the Big South Fork National River and Recreation Area. 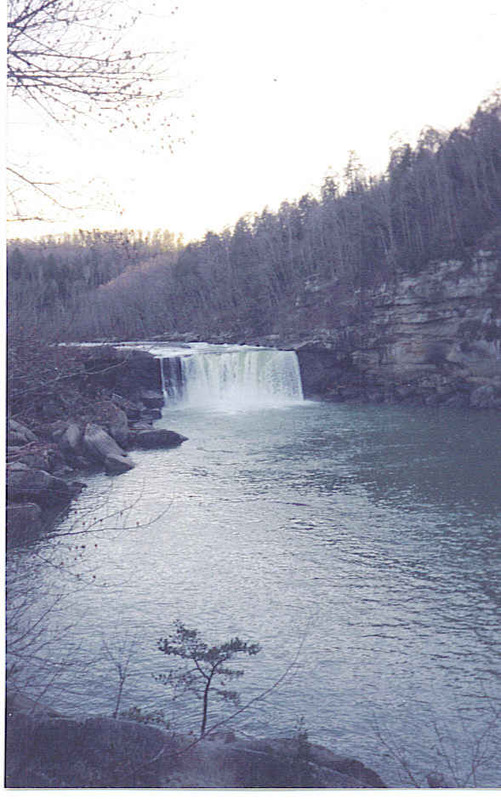 Carved in the side of a mountain, it overlooks the Big South Fork of the beautiful Cumberland River. Since this stop was in the winter time, the museum was not open, but still could enjoy the atmosphere of the mining camp. There wasn’t another living person around that day so had the freedom to move at a leisurely pace along the paved walkways in this re-created mining town. …”I owe my soul to the Company’s Store.” That was the life of the coal miners in this small town of Blue Heron from 1939-1962. From this isolated location, everything they purchased had to come through the Company Store. Instead of cash, miners would “draw scrip”, unexchangeable credit vouchers which could only be used at the company’s store. Coal companies had their own scrip coins with their personal emblem , thus indeed miners did end up owing their soul to the Company’s Store. They had no way to establish cash savings to find another workplace. Luckily, some coal mines gave their miners a choice of cash or scrip for payment, and eventually the United Mine Workers Union forced them to discontinue the use of scrip completely. Stops along the way contained recordings of the miners’ stories and provided a resting place as well. 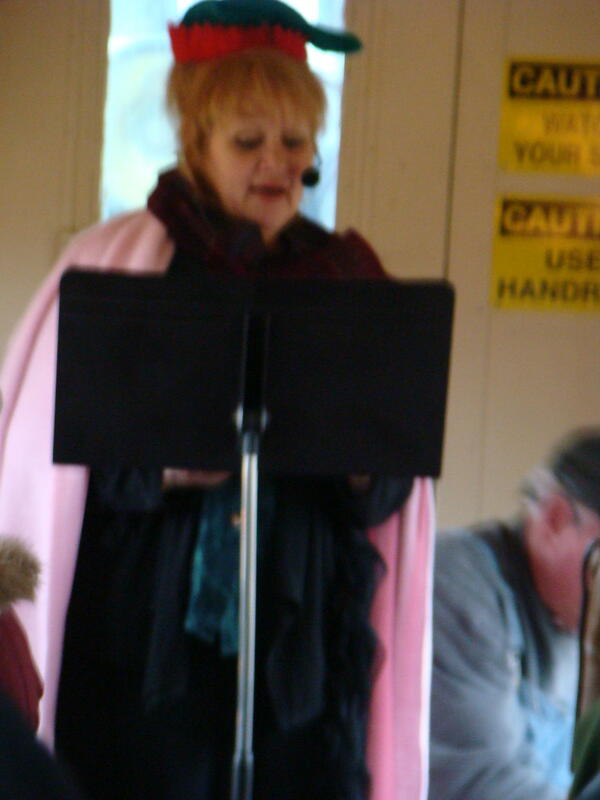 The voices heard were those of long ago residents of Blue Heron as they shared their stories and memories of life at the mining camp. Just looking into the entrance of the Blue Heron Coal Mine gave an understanding of what these miners faced each day. Inside there were figures of miners picking, drilling, and loading. 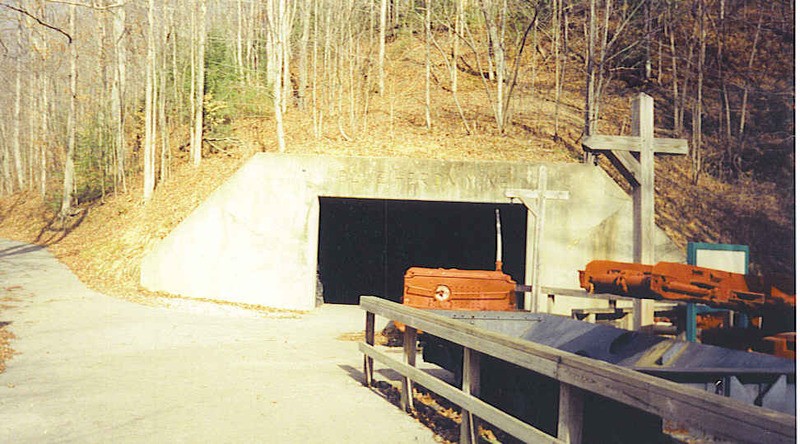 One of the recordings there described the mine as “dark as a dungeon, camp as the dew,” as singer Merle Travis portrayed the mines in his 1946 recording. Outside this entrance the coal cars and locomotives were originals from the mining camp. Was exciting to walk across the old tipple bridge to get a bird’s eye view of the area. 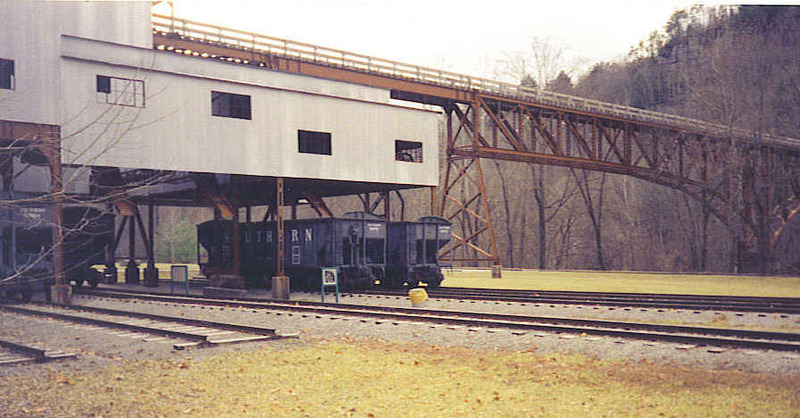 This tipple was able to screen, separate, and load about 400 tons of coal an hour. Sometimes over 200 men worked in this camp. When they got off work, most headed to the big bath house so they could shower and change their clothes before heading home for the day. That saved a lot of coal dust in the houses! Workers actually went on a two day strike to get a bigger bath house, but of course didn’t get paid while on strike. Imagine their families really appreciated the cleaner workers coming home at night. Learned a little more about the life of a coal miner…their living and working conditions. Next time perhaps will take the Big South Fork Scenic Railway, which reaches the heart of the canyon along the Cumberland River and drops passengers off for a visit to the Blue Heron Coal Mine. Add a Coal Miner’s Lunch all wrapped up in a bandanna for a better taste of the mining experience.